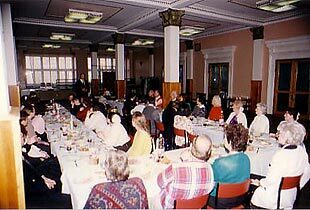 Up to 250, from the very young to the aged, received meals weekdays. They also heard about Jesus and received Christian materials. 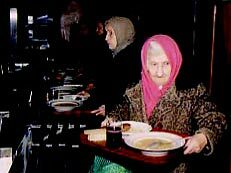 More recently, dozens of those who were sustained in the Soup Kitchen are now infirmed and live in Flats across Moscow. A couple of our dedicated long-time employees, Vera and Galena, and an ordained minister, Vladimir, go to their flats, most on 7th floor or above (no elevators), deliver foods, fruit, do light cleaning, read Scriptures and pray. 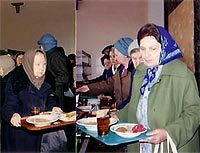 League of Prayer - Russia Soup Kitchen.